Another Saturday and another early morning alarm call. Although compared to last weekend, the 3:15am beep was a lie-in from the 1:30am from the previous week. Training on the top end of the course means early starts, given the 2 hour drive to reach our destination, checkpoint one. The plan for today was a sharp out and back from the GNW CP1, through to the gate on the Congewai road, approximately 17kms down, and then head out into the rainforest section for some bush walking fun. The section from CP1 towards 2 is not the prettiest by any stretch of the imagination, and is in relative terms, flat too. There’s a few ups and downs to keep things interesting, but it’s very much foot on the gas here, before a 3km descent down to the valley where the course hits the road. Reaching the gate in a sharpish 1hr 46mins, we turned around for the climb back up the hill, and the joking stopped for 25 minutes or so while we put the game faces on for the slog. I’m not sure what time we came back in, but it was similar and made for a good ‘tempo-ish’ session along that particular firetrail in the world of ultra-running. After a lightening quick turnaround, a few of us made the trip down to the very technical and slow rain forest section. I hadn’t been down here in about two years, so it was good to re-acquaint myself with the surroundings, especially doing it in reverse. It was here that I decided that some sections were going to be pretty much bush walking territory, so rather trying to push on through at pace it was better just making sure I knew what I was doing and where I was doing it. Here, a few people did their own thing and I was happy just taking in what is a stunning and brutal part of the course. Admittedly there were plenty of moments where I did have to stop for a few seconds to work out where the hell to go, especially in reverse, but after due consideration the right way was never in doubt. After the last climb back out of the rain forest and up to Heaton Gap (I believe it’s named after the man who discovered the location), I decided to take the road back (approx. 8kms) instead of another slog back through the rainforest. Here I could get the pace back up to something around 5min kms and get some hard running in for the last section. Nice one Dan,I have this thing about only running the rain forest once before the Event,Also I think you will find from the top of Heaton to CP1 along the road is closer to 8.6 km’s give or take 50-60 mts so that makes the last 8 km’s real good because there are still a couple of climbs on the way back. I didn’t take much notice of the distance. I thought it was closer to 10kms, but seems not… still a few nice climbs as you say to keep things interesting there and a good end to the run. 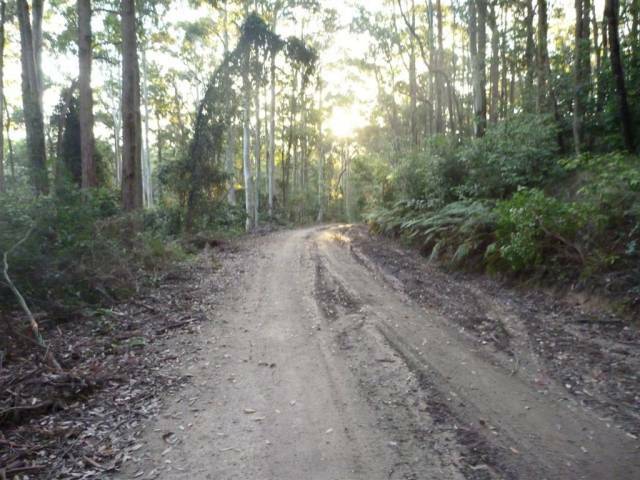 It is such a bush walk through there at times though, but beautiful nonetheless. I agree it is a nice bush walk in that section. Last time I was there, there had been a few rock and tree falls – had they been cleared ? That section from CP1 to Baraba is a real achilles heel . Relatively flat and open. The more I do it , the more I see why.